There were many things to do once we had the land title in hand before we could get our building permit for the yurt. The first order of business was to find the trailer’s septic system so we could determine if it was in good enough shape to tap the yurt into. We had a basic idea of where the septic tank was, according to the original permits we found at the county courthouse, but Gavin spent the better part of two days digging holes before actually locating the box. We got the septic pumped and inspected, and it was determined to be in good shape. The next step to getting the building permit was to have VDOT sign off on the ingress to the property. Since the access road had been there for so long, VDOT didn’t think it would be a problem to approve. But once they inspected it they figured they needed to put in a new culvert pipe. So that process took another couple of weeks. We spent a day cleaning out the trailer. After several truckloads to the dump and adding some padlocks on the doors, we now have a place for storing building materials and tools. Eventually, after we build a barn, we’ll bring in a dumpster and demolish the trailer. Meanwhile we had ordered the yurt and Gavin decided on a tractor. 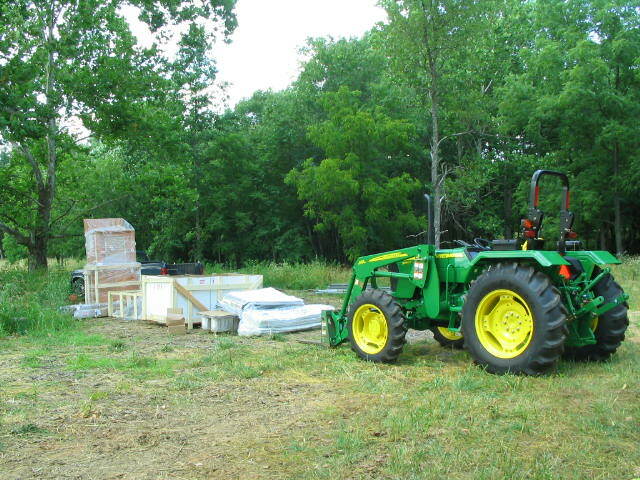 The tractor and the yurt arrived on the same day. We moved all the yurt pieces except the dome into the trailer for storage until the yurt raising, which ended up being three months later! 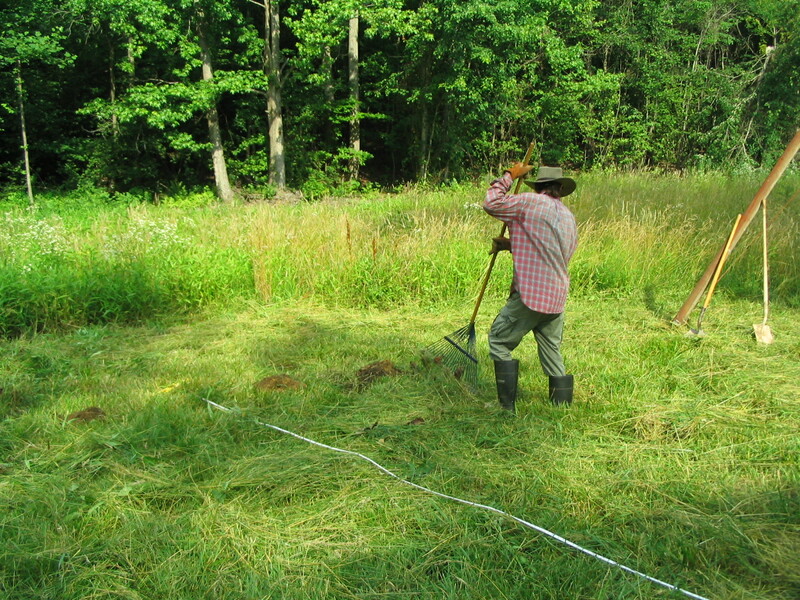 Next we bought a rotary mower, which is an attachment for the tractor, to deal with the 20 acres of waste-high weeds. Unfortunately a lot of this area still has not been mowed and is probably harboring pest insects. But it is also providing habitat for the quail and deer populations we see from time to time. During this time we were planning the yurt layout and mechanical systems, because we had to submit plans to the building department. It was a challenge to fit all the living requirements into the 300 square-foot space! I guess we’ll just have to spend more time outside! Which is the ultimate goal anyway. So we had the drawings approved with the building department and began construction! Our building inspector and his department have been extremely helpful and willing to work with us on this project. We are very lucky in this regard.